Australian solid employment data offset by speculation the RBA may need to cut rates. Global economic growth concerns took their toll on a weakened Aussie. The Aussie started the day with a strong footing, advancing against the greenback up to 0.7166, on the back of a solid employment report which showed that the Australian economy added 21.6K new jobs in December, better than the 16.5K expected. The unemployment rate decreased to 5.0%, although the participation rate was also down to 65.6% from 65.7%. The pair suffered a sharp U-turn and fell, as the National Australia Bank rose its interest rated for home loans. The move followed other major banks that increase their rates in September. The hike of mortgage rates in a depressed housing market triggered speculation that the RBA may need to lower its rates to offset the impact on borrowers, hence, the slump in AUD. Dollar's strength was exacerbated during London's trading hours, as EU worse-than-expected Markit PMIs exacerbated concerns about a global economic slowdown. Also, IMF's Lagarde, speaking at Davos, said that Chinese economic slowdown is real, and despite under control, would constitute a risk. The US Senate will meet today to vote a funding extension until February 8. There were rumors making the rounds about lawmakers discussing Trump's border wall funding, but there were later denied. So far, US President Trump has rejected funding bills coming from the Houses and seems unlikely this time it will different. In the data front, attention will center on the January preliminary Markit PMIs., with the Composite index foreseen at 54.2 vs. the previous 54.4. Trading around its daily lows, the pair has detached from the congestion of moving averages in the 4 hours chart, all of them in the 0.7130/40 price zone, usually a sign of directional strength, in this case, to the downside. 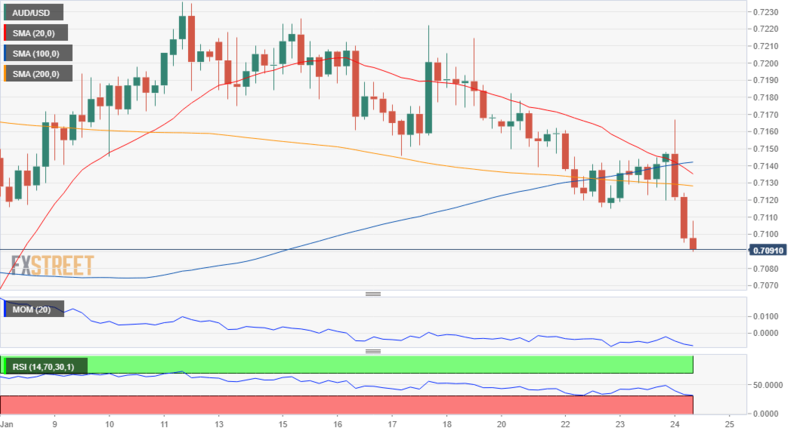 Technical indicators in the mentioned chart hold within negative levels, with the Momentum directionless but the RSI also backing a downward extension as it maintains its bearish slope near 31. The pair has also broken below the 23.6% of its latest bullish run at 0.7125, the immediate resistance. The bearish case will be stronger on a break below 0.7070, a strong static support level.